When will be Baseball Tonight: Sunday Night Countdown next episode air date? Is Baseball Tonight: Sunday Night Countdown renewed or cancelled? Where to countdown Baseball Tonight: Sunday Night Countdown air dates? Is Baseball Tonight: Sunday Night Countdown worth watching? 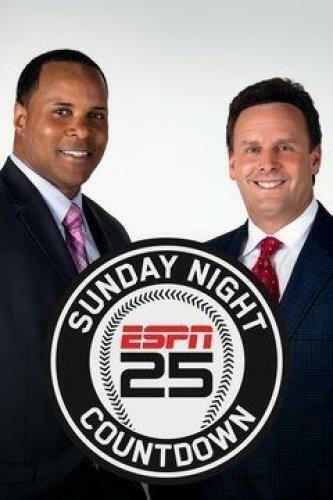 Leading into each of ESPN's Sunday Night Baseball' telecasts is Baseball Tonight: Sunday Night Countdown. Host Karl Ravech teams with analyst/former major leaguer Aaron Boone and reporter Tim Kurkjian to present fans a detailed preview of the network's exclusive, national game of the week. Highlights of the day's other games, interviews with players and managers, web gems -- the best defensive plays of the week -- and replays of all the Sunday home runs also fill the hourlong shows. Host Karl Ravech, along with Aaron Boone and Tim Kurkjian, provide news, analysis and a preview of the upcoming game. Baseball Tonight: Sunday Night Countdown next episode air date provides TVMaze for you. EpisoDate.com is your TV show guide to Countdown Baseball Tonight: Sunday Night Countdown Episode Air Dates and to stay in touch with Baseball Tonight: Sunday Night Countdown next episode Air Date and your others favorite TV Shows. Add the shows you like to a "Watchlist" and let the site take it from there.